U.S. trade and investment agreements have almost always resulted in growing trade deficits and job losses. Under the 1993 North American Free Trade Agreement, growing trade deficits with Mexico cost 682,900 U.S. jobs as of 2010, and U.S.-Mexico trade deficits and job displacement have increased since then. President Obama promised that the U.S.-Korea Free Trade Agreement would increase U.S. goods exports by between $10 billion and $11 billion, supporting 70,000 American jobs from increased exports alone. However, in the first two years after that deal went into effect, U.S. exports actually declined, and growing trade deficits with South Korea cost nearly 60,000 U.S. jobs. The U.S. trade deficit with South Korea continues to rise. This is important to keep in mind as secret negotiations for the Trans-Pacific Partnership (TPP) continue, most recently in Washington and New York. The United States has a large and growing trade deficit with Japan and the 10 other countries in the proposed TPP. This deficit has increased from $110.3 billion in 1997 to an estimated $261.7 billion in 2014. Additionally, several members of the proposed TPP deal are well known currency manipulators, including Malaysia, Singapore, and Japan. In fact, Japan is the world’s second largest currency manipulator, behind China. The United States should not sign a trade and investment deal with these countries that does not include strong prohibitions on currency manipulation. Yet U.S. Trade Representative Michael Froman has testified that currency manipulation has not been discussed in the TPP negotiations (McCormack 2014). The U.S.-Japan goods trade deficit reached $78.3 billion in 2013, reducing U.S. GDP by $125.3 billion or nearly 0.75 percent of actual GDP in that year. Japan’s currency manipulation was the most important cause of this deficit, which displaced 896,600 U.S. jobs in 2013, with job losses in every state and nearly all U.S. congressional districts. The 896,600 jobs eliminated by the U.S. goods trade deficit with Japan included 148,400 direct jobs in commodity and manufacturing industries that competed with unfairly traded imports and exports from Japan. The currency-manipulation-fueled trade deficit was also responsible for the loss of 412,000 indirect jobs in supplier industries, and an additional 336,200 “respending” jobs—jobs that would have been supported by the wages of workers displaced by trade with Japan. The nearly 900,000 direct, indirect, and respending jobs displaced by the U.S.-Japan trade deficit in 2013 affected multiple sectors and industries. Job losses include 466,000 manufacturing jobs (52 percent of the jobs lost due to the U.S.-Japan trade deficit). Within manufacturing, by far the largest losses occurred in motor vehicles and parts, which lost 118,800 jobs (13.3 percent of total jobs lost). Other manufacturing industries with large losses include machinery (96,600 jobs), fabricated metal products (80,800 jobs), and computer and electronic parts (66,100 jobs). The U.S.-Japan trade deficit was also responsible for significant job losses outside of manufacturing in administrative and support industries (61,800 jobs); health care and social assistance (60,500 jobs); retail trade (51,800); professional, scientific, and technical services (50,000 jobs), and accommodation and food services (48,500 jobs). Net trade with Japan also created a total of 63,600 jobs in U.S. agricultural industries. The U.S.-Japan trade deficit also reduced tax revenues and increased safety net expenditures in 2013, increasing the federal budget deficit by $46.4 billion, 7.4 percent of the federal budget deficit in that year. If the U.S. trade deficit with Japan were to persist at the 2013 level for the next 10 years, the loss of jobs and wages would add $460 billion to the total federal deficit over the next decade. The U.S.-Japan trade deficit also reduced net state and local resources by $17.5 billion in 2013, alone. Each of the 50 states and the District of Columbia lost jobs due to the U.S. trade deficit with Japan in 2013. Job losses were greatest in Michigan, where they constituted 1.34 percent of total state employment. Eight of the 10 states with the highest job losses (as a share of total employment) are in the Midwest or the East South Central census regions, all states where manufacturing predominates: Michigan (56,200 jobs), Indiana (33,700 jobs), Ohio (50,900 jobs), Kentucky (16,400 jobs), Wisconsin (24,300 jobs), Tennessee (23,200 jobs), Alabama (16,000 jobs) and Illinois (45,500 jobs). Rounding out the top 10 states losing the largest shares of jobs were South Carolina (16,800 jobs) in the South Atlantic region, and New Hampshire (5,300 jobs) in New England. The U.S. trade deficit with Japan resulted in net job losses in all but three U.S. Congressional Districts, and has displaced up to 6,000 jobs in a single U.S. congressional district. In the 20 congressional districts with the largest shares of jobs lost, losses ranged from 3,100 to 6,000 jobs. 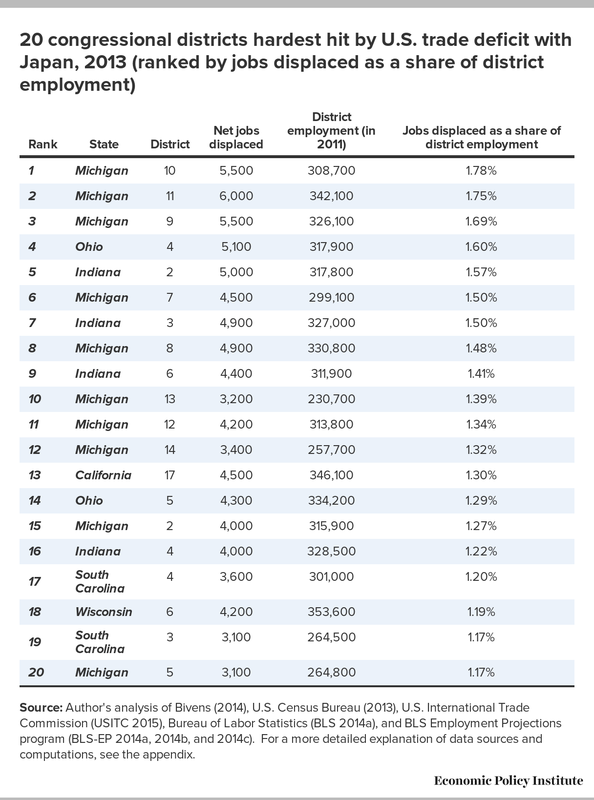 The 10th Congressional District in Michigan was the hardest hit district in the country, ranked in terms of jobs displaced as a share of total district employment, losing 5,500 jobs (1.78 percent of total employment). Among these top 20 U.S. congressional districts, job losses as a share of district employment ranged from 1.17 percent to 1.78 percent. Of the states with top-20 job-losing districts, the hardest hit state was Michigan (with 10 districts in the top 20, followed by Indiana (four districts); Ohio and South Carolina (two districts each); and California and Wisconsin (one each). Currency manipulation is the most important cause of the large and growing U.S. trade deficit with Japan. In the past two years, Japan has driven down the value of the yen primarily through large purchases of foreign assets, and also and by announcing its intention to reduce the yen’s value. Purchases and holdings of foreign exchange reserves by the Bank of Japan and of other foreign assets by Japan’s Government Pension Investment Fund (GPIF) are an indispensable element of Japan’s currency policy. Without its massive government holdings of foreign assets, and its continuing and periodic massive purchases of new foreign assets, the government of Japan would have been unable to prevent the yen from adjusting to levels consistent with large trade and current account surpluses. It is important to distinguish the effects of quantitative easing (defined as central bank purchases of assets denominated in its own currency) from currency intervention (defined as government purchases of assets denominated in foreign currencies). All countries should be free to engage in quantitative easing and other elements of domestic monetary policy, subject only to their own domestic policy goals and constraints (such as excessive inflationary pressure, as perceived by domestic authorities, as well as domestic employment and wage targets). Domestic monetary policies should not be labeled as part of currency manipulation, and such policies should not be constrained by international agreements. Prudential measures are appropriate to deal with short-term economic problems. In short, all countries should be free to print money to purchase their own domestic assets. On the other hand, countries should be strongly discouraged from purchasing and holding assets denominated in foreign currencies, which is the central, defining tool of currency manipulation. In this context the United States should insist that currency manipulation be directly addressed in the proposed Trans-Pacific Partnership. Members of the TPP should also agree to rebalance trade and currency markets, including through divestiture of excess foreign assets in government portfolios, before any trade and investment agreement takes effect. They should also forswear the use of currency manipulation in the future, and submit to strong, binding currency disciplines in the event these commitments are violated. Growing trade deficits have cost U.S. workers millions of jobs over the past two decades. Most of the lost jobs were good jobs in manufacturing industries. Under the 1993 North American Free Trade Agreement (NAFTA), growing trade deficits with Mexico cost 682,900 U.S. jobs through 2010, and U.S.-Mexico trade deficits and job displacement have increased since then (Scott 2011, 2014c). President Obama promised that the U.S.-Korea Free Trade Agreement would increase U.S. goods exports by between $10 billion and $11 billion, supporting 70,000 American jobs from increased exports alone (White House 2010). However, in the first two years after that deal went into effect, U.S. exports actually declined, and growing trade deficits with Korea cost nearly 60,000 U.S. jobs (Scott 2014d). The job losses stemming from past trade deals must inform continuing negotiations for the Trans-Pacific Partnership, which have proceeded in secret, most recently in Washington and New York (Arirang News 2014, and Brunnstrom 2015). The United States has a large and growing trade deficit with Japan and the 10 other countries in the proposed TPP; this deficit with the TPP countries increased from $110.3 billion in 1997 to an estimated $261.7 billion in 2014 (Scott 2014a). Elimination of currency manipulation by about 20 developed and developing countries could reduce the United States’ global trade deficit by between $200 billion and $500 billion (Bergsten and Gagnon 2012). This reduction could increase U.S. GDP by between $288 billion and $720 billion, and create between 2.3 million and 5.8 million U.S. jobs (Scott 2014b). The biggest tool of currency manipulation is the purchase of assets denominated in the currencies of other countries, which is known as currency intervention. Purchases of foreign assets by central banks and other government agencies in Japan, China, and other countries directly increase the demand for foreign currencies, especially the U.S. dollar. This increases the value of the dollar (the exchange rate), and drives down the value of the currency of the country purchasing foreign assets. Foreign assets include Treasury bills, other government assets (which are held as foreign exchange reserves by central banks), and foreign stocks and bonds (purchased by other government agencies, such as the Japanese pension fund, discussed below). The importance of exchange-rate manipulation in driving global trade imbalances is clear. There is a near perfect correlation between official purchases of foreign exchange reserves and other foreign assets and the global current account surpluses of currency manipulators. Recent research has shown that causation runs from currency manipulation to trade surpluses among the manipulators, and not the other way around. Gagnon (2013) estimated that a “country’s current account balance increases between 60 and 100 cents for each dollar spent on intervention.” Importantly, his data include asset purchases by government-owned “sovereign wealth funds” (also known as SWFs) which now control over $7.0 trillion dollars in assets (SWFI 2015). For example, in November 2014, Japan’s gigantic Government Pension Investment Fund, whose assets totaled over $1.2 trillion in 2013, announced that it intended to raise the target share of its assets held in foreign stocks and bonds from 23 percent in 2013 to 40 percent (approximately $480 billion) in the near future (Warnock and Narioka 2014). This will have a significant impact on Japan’s expected future trade surplus because it will directly suppress the value of the yen, in ways that are described below. Japan has a long history of currency manipulation. Between 2000 and November 2014 its holdings of foreign exchange reserves alone nearly quadrupled, rising from $347 billion in 2000 to $1,208 billion in November 2014, an increase of $861 billion (IMF 2015). Furthermore, the holdings of foreign assets in Japan’s GPIF increased steadily in this period, reaching $308.8 billion in 2013, and are projected to increase to $480 billion or more in the near future (GPIF 2015). Japan’s real effective exchange rate index declined steadily from 131.4 in 2000 to 74.5 in 2007, a decline of 43.3 percent (International Monetary Fund 2015).2 During this period its current account balance, the broadest measure of Japan’s trade in goods, services, and income, increased from $130.7 billion (2.8 percent of its GDP) to $212.1 billion, or 4.9 percent of GDP (IMF 2014). Market forces and the Great Recession combined to push the yen up to a recent peak of 109.0 in 2012, a 46.2 percent increase since 2007. The rise of the yen and the 2011 Tōhoku earthquake and tsunami combined to push up Japan’s imports and suppress exports, creating a crisis in Japan’s trade and current accounts. Japan’s current account surplus shrank to $58.7 billion in 2012 and Japan developed its first global goods trade deficit in more than a decade, which reached $53.5 billion in that year (IMF 2015). Japan’s trade and economic crises set the stage for the election of Prime Minister Shinzo Abe in December 2013 and subsequently gave his Liberal Democratic Party control of both houses of the Japanese Diet (parliament) in 2012 and 2013 (The Economist 2013). Abe is widely recognized for adopting a three-part plan for revitalizing Japan’s economy. The widely recognized parts of this plan included a substantial increase in government spending, liberalization of monetary policy, and deregulation of the Japanese economy. Japan’s current account and trade balance remained suppressed in 2013 by several temporary factors, including the hangover from the Tōhoku earthquake and tsunami, increased demand for imports in anticipation of value-added tax increases taking effect in 2015, and the short-run impacts of the fall of the yen, which increased the cost of Japanese imports. Over the next few years the fall in the yen is expected to stimulate exports and suppress imports, resulting in growing trade and current account balances (as shown below). Maintain and increase foreign exchange reserves and government purchases of other foreign assets. In 2011, prior to Abe’s election, the Bank of Japan engaged in a massive, $185 billion purchase of foreign exchange reserves. 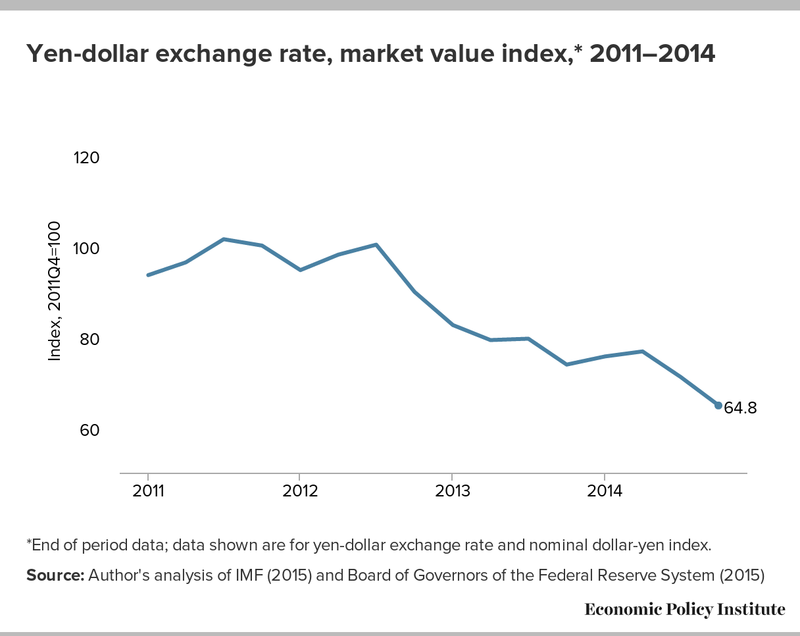 This had no immediate impact on the value of the yen, which gained slightly against the dollar between the end of 2011 and the third quarter of 2012 (IMF 2015). However, maintaining a large stock of government-controlled foreign assets will have a strong, positive effect on Japanese trade accounts, due to portfolio balance effects. For Japan, which has a large and open private capital market, changes in the stock of foreign assets affect Japan’s trade flows with a lag, as shown below. Increase holdings of foreign assets by Japan’s Government Pension Investment Fund. In November 2014 the GPIF announced its plan to increase target holdings of foreign stocks and bonds from 23 percent of its total $1.2 trillion dollars plus in assets in 2013 to 40 percent in the near future (Warnock and Narioka 2014). GPIF data show that the shift was already in progress in 2012 and 2013, and that actual foreign holdings exceeded even the 2013 target. Between 2012 and 2013 the GPIF increased its actual holdings of foreign assets from 21.4 percent ($244.2 billion) to 25.7 percent ($308.8 billion). While billed as a financial diversification effort, the GPIF announcement was also a public commitment to increase Japan’s total government holdings of foreign assets, which will have long-term impacts on Japan’s expected trade and current account surpluses. Purchases and holdings of foreign exchange reserves by the Bank of Japan and of other foreign assets by the GPIF are the sine qua non of Japan’s currency policy. Without its massive holdings of foreign assets, and its continuing and periodic massive purchases of new foreign assets, the government of Japan would have been unable to prevent the yen from adjusting to levels consistent with trade and current account balances. The United States needs to include in the TPP and any future trade or investment agreements currency disciplines that would compel Japan and other currency manipulators to divest themselves of excess holdings of foreign assets, or to otherwise be penalized or incur offsets to their currency manipulation. Absent such disciplines, the United States should not complete and Congress should not approve implementing legislation for the proposed Trans-Pacific Partnership or any future agreements. Without an effective currency agreement, the United States could be locked into a trade and investment treaty with Japan that would prohibit actions that are necessary to restore equilibrium to currency markets and rebalance trade with currency manipulators. In the context of Japan’s continuing currency intervention, other policies implemented by the Abe government and the Bank of Japan have reinforced downward pressures on the yen. This has increased the importance of directly addressing currency manipulation by Japan. For example, by announcing in 2012 his intention to drive down the value of the yen, Abe sent a strong signal to financial markets that his government would penalize markets if the yen failed to depreciate. In addition, Japan followed the lead of the United States and other countries in the wake of the Great Recession and engaged in quantitative easing (defined as central bank purchases of assets denominated in the host country’s own currency). While quantitative easing by the U.S. central bank had no significant long-term effect on the real value of the dollar, quantitative easing in Japan was significantly more extensive than in the United States, and contributed to the subsequent fall in the yen, but this effect was incidental to its primary purpose, which was to stimulate and reflate Japan’s domestic economy. It is important to distinguish the effects of quantitative easing from currency intervention (defined as government purchases of assets denominated in foreign currencies). All countries should be free to engage in quantitative easing and other elements of domestic monetary policy, subject only to their own domestic policy goals and constraints (such as excessive inflationary pressure, as perceived by domestic authorities, as well as domestic employment and wage targets). Domestic monetary policies should not be labeled as part of currency manipulation, and they should not be constrained by international agreements. Prudential measures are appropriate to deal with short-term economic problems. It does appear that large-scale quantitative easing in Japan has reinforced the fall of the yen, as noted below. The U.S. Federal Reserve should monitor these effects, and it may wish to consider limited, countervailing purchases of Japanese assets. But quantitative easing alone, in the absence of Japanese purchases and stockpiles of foreign assets, would be unlikely to disturb the long-term trend value of the yen. With this background in mind, the following sections review each of the factors considered above and their implications for U.S.-Japan trade. As noted above, on a global level, there is a near perfect correlation between official purchases of foreign exchange reserves and other foreign assets and the global current account surpluses of currency manipulators (Gagnon 2013, Figure 1). Recent research has shown that the stock of foreign assets also contributes to currency suppression and sustained current account surpluses (Bayoumi, Gagnon, and Saborowski 2014). 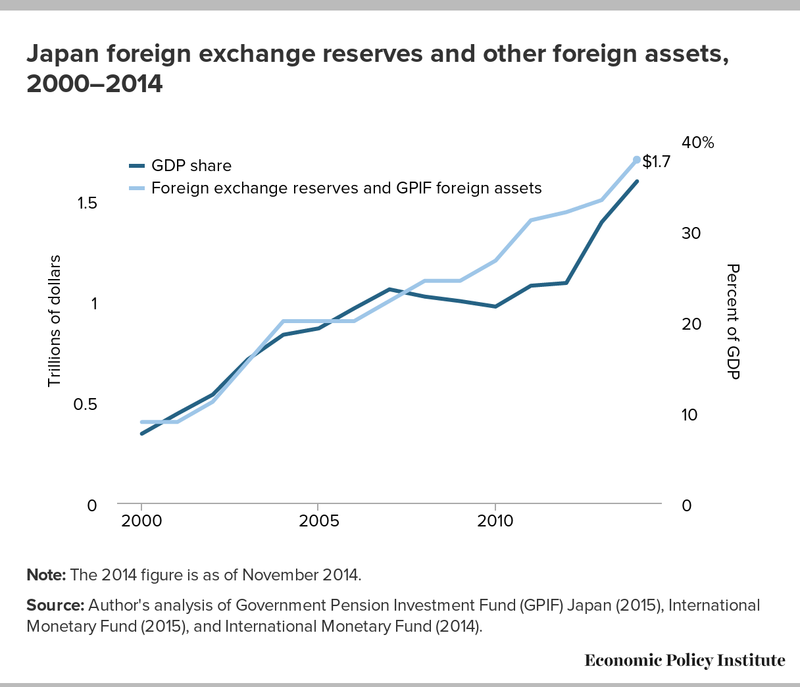 Estimates of Japan’s total holdings of foreign exchange reserves and other foreign assets are shown in Figure A. Estimated total foreign assets rose from $362 billion in 2000 to $1.7 trillion in November 2014, including targeted holdings of $480 billion, 40 percent of the GPIF’s $1.2 trillion in pension fund assets.5 The latter is a significant increase in foreign asset holdings that will continue to suppress the value of the Japanese yen, and is expected to result in growing Japanese trade and current account surpluses, as shown below. Note: The 2014 figure is as of November 2014. Source: Author's analysis of Government Pension Investment Fund (GPIF) Japan (2015), International Monetary Fund (2015), and International Monetary Fund (2014). Taken as a share of GDP, Japan’s total foreign-asset holdings rose from 7.6 percent in 2000 to 30.9 percent in 2013 (actual) and 35.4 percent in 2014 (projected). Japan’s enormous, episodic foreign-asset purchases (such as the Bank of Japan’s purchase of $185 billion in foreign exchange reserves in 2011) has also provided a credible threat that the Japanese government will intervene any time that the yen threatens to rise. This helps to account for the failure of the yen to rise after 2012. Certainty that the yen will not rise (above a widely perceived ceiling) has also contributed to the growth of the so-called carry trade, which has persisted in Japan for decades. The carry trade involves borrowing in a very-low-interest-rate country (such as Japan), converting the loan into a currency in a higher-interest-rate country (such as the United States) and investing the proceeds in the high-interest-rate country. Most of this trading is done by large financial firms with massive “leverage of 100 or 300 to one” (Dohmen 2014). As a result, U.S. bond and stock prices have increased, and the U.S. dollar has risen as well (versus the yen), as a result of increased private-sector demand for U.S. financial assets. The carry trade has existed for many years, and helps account for the failure of the yen to rise. It also helps explain persistent U.S. trade deficits. But the carry trade would not exist were it not for the certainty that the yen would not rise, which is provided by Japan’s purchases of U.S. assets. The large GDP share of Japan’s foreign assets will have a significant impact on Japan’s trade and current accounts through the portfolio balance channel. These factors are explained below. The yen was trading near an all-time high in the range of 76 to 79 yen per dollar throughout much of 2011 and continuing through the third quarter of 2012 (IMF 2015). The yen weakened slightly in the fourth quarter of 2012, during the Abe election campaign. It began a precipitous decline once he took office, falling to near 120 yen per dollar by the end of 2014, an increase of nearly 55 percent in the value of the dollar, comparing end-of-period values for the third quarter of 2012 (pre-election) with the last quarter of 2014 (Board of Governors of the Federal Reserve System 2015). Figure B presents data on the market value of the yen (in cents per yen terms), using an index set to 100 in the fourth quarter of 2011, one year before the Japanese general election. The market value of the yen was roughly stable between the fourth quarter of 2011 and the third quarter of 2012. The yen began to decline steadily after the Abe election in December 2012, losing 35.3 percent of its value between 2012Q3 and 2014Q4 (end of period values). This precipitous depreciation has substantially, and artificially, increased the competitiveness of Japanese exports. Currency manipulation acts as a subsidy to all Japanese exports, and a tax on U.S. exports to Japan, and all countries where U.S. firms compete with Japanese products. *End of period data; data shown are for yen-dollar exchange rate and nominal dollar-yen index. The immediate causes of the yen’s decline include Abe’s announcement of his intent to devalue the yen (Ito and Mallard 2012) and the steady increase in Japan’s holdings of foreign exchange reserves and other foreign assets (Figure A, earlier). These factors were also reinforced by Japan’s aggressive quantitative easing regime, especially after Abe took office in 2012. In order to carry out quantitative easing, central banks create money by purchasing government bonds and other assets such as mortgage-backed securities from banks (R.A. 2014). This increases the value of assets held by the central bank and the size of the monetary base. Quantitative easing has been used to stimulate bank lending when short term-interest rates controlled by central banks have been reduced to their lowest practical level (the zero lower bound). The Unites States, Japan, and other countries have engaged in extensive QE purchases in the wake of the Great Recession of 2007–2009. 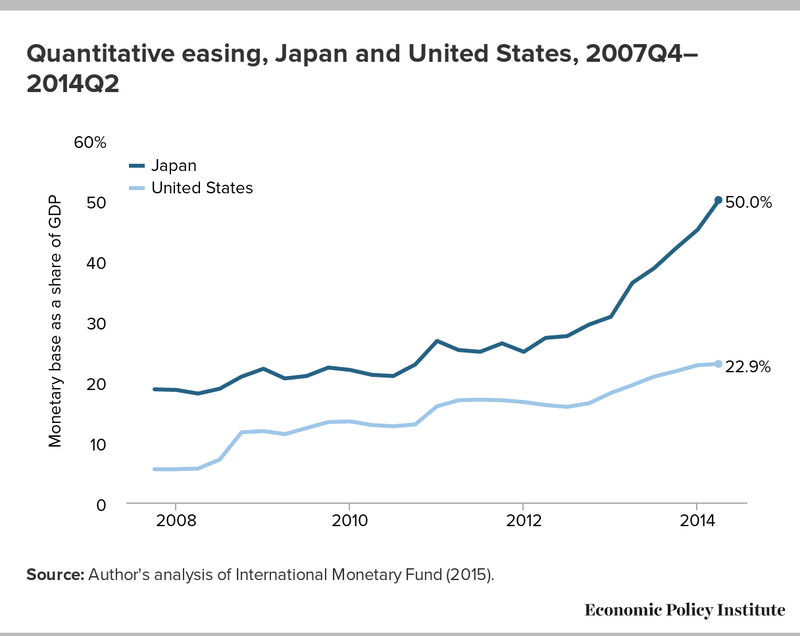 The U.S. and Japan have both engaged in similar amounts of quantitative easing.6 However, the U.S. economy is roughly three times as large, so QE in Japan has been much larger, relative to GDP, throughout the recession and recovery, as shown in Figure C. Between the fourth quarter of 2007 and the second quarter of 2014, the U.S. monetary base as a share of GDP has expanded by 17.4 percentage points (from 5.5 percent to 22.9 percent), while the GDP share of Japan’s monetary base increased by 31.3 percentage points (from 18.7 percent to 50.0 percent). Source: Author's analysis of International Monetary Fund (2015). Japan’s QE purchases have expanded massively since the beginning of the Abe administration, as shown in Figure C. Between 2012Q3 and 2014Q2, Japan’s monetary base as a share of GDP increased by 22.5 percentage points, while U.S. QE purchases increased only 7.1 percentage points as a share of GDP, less than a third of the growth rate in Japan. As noted by Laffer (2014, 24), “the Bank of Japan put further depreciating pressures on the yen” through the expansion of its monetary base. As a result of all these policies (both QE and direct currency intervention), “the yen’s real effective exchange rate has depreciated to its 1982 level, which is below the 2007 level,” according to Bank of Japan data cited by Laffer (2014, 24). Chin (2013b) has also noted that Japan’s expansionary monetary policy has caused the yen to depreciate. The yen’s rapid, recent decline is expected to significantly improve Japan’s trade and current account balances in the future. 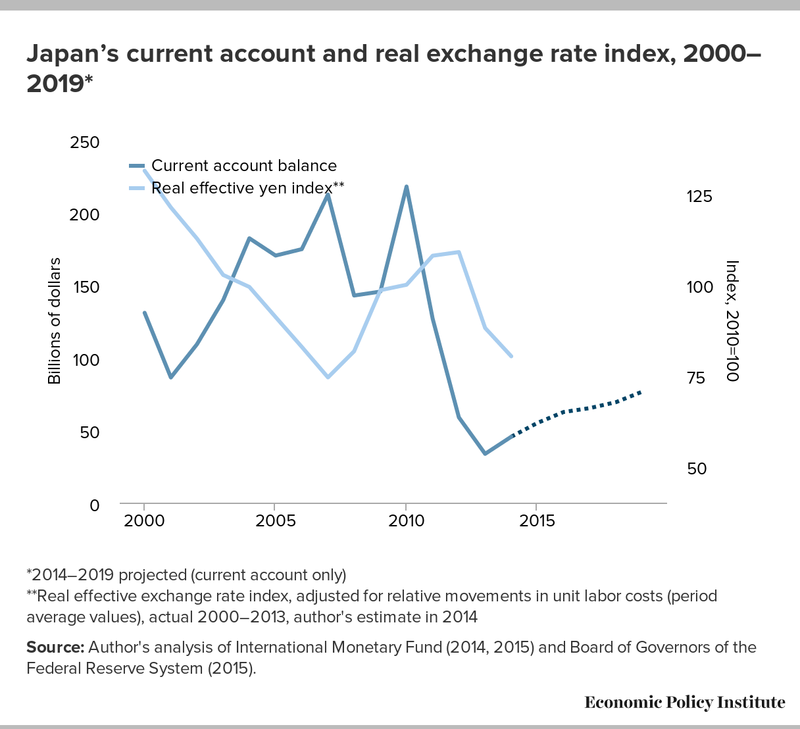 There is a strong relationship between the real value of the yen and Japan’s current account balance, as shown in Figure D. The real value of the yen (as reflected in Japan’s real effective exchange rate index) fell steadily and rapidly between 2000 and 2007, when the real value of the index declined 7.8 percentage points per year (on average). During this period, Japan’s total current account balance increased from $130.7 billion to $212.1 billion. As a share of GDP, it increased from 2.8 percent in 2000 to 4.9 percent in 2007. Japan’s current account is expected to improve significantly in the long run, as shown in Figure D, which includes the IMF’s projections for Japan’s current account balance from 2014 to 2019 (IMF 2014). The IMF projects that Japan’s current account surplus will more than double in the future, rising from $33.6 billion in 2013 to $76.4 billion in 2019, and from 0.7 percent of GDP in 2013 to 1.4 percent in 2019. However, other data and analysis presented below suggest that Japan’s current account could and should improve much more rapidly over the next few years. Source: Author's analysis of International Monetary Fund (2014, 2015) and Board of Governors of the Federal Reserve System (2015). Chin has developed new estimates of Japan’s import and export elasticities and determined that for Japan, “an exchange depreciation results in an improved trade balance” (Chin 2013a, abstract). Chin’s estimates were developed in early 2013. His estimates did not include the sharp depreciation of the yen that actually occurred in 2013 and 2014 (Figure B, above), which only serves to strengthen his conclusions. In addition, recent and projected increase in Japan’s government holdings of foreign assets (Figure A, above), suggest that Japan’s current account balance will improve much more strongly in the future. Recent research has shown that there is a strong correlation between increased holdings of foreign assets and current account balances. Gagnon (2013, abstract) found that “a country’s current account balance increases between 60 and 100 cents for each dollar spent on intervention.” Thus, the steady increase in Japan’s holdings of foreign exchange reserves and other foreign assets (Figure A) put upward pressure on Japan’s current account balance. 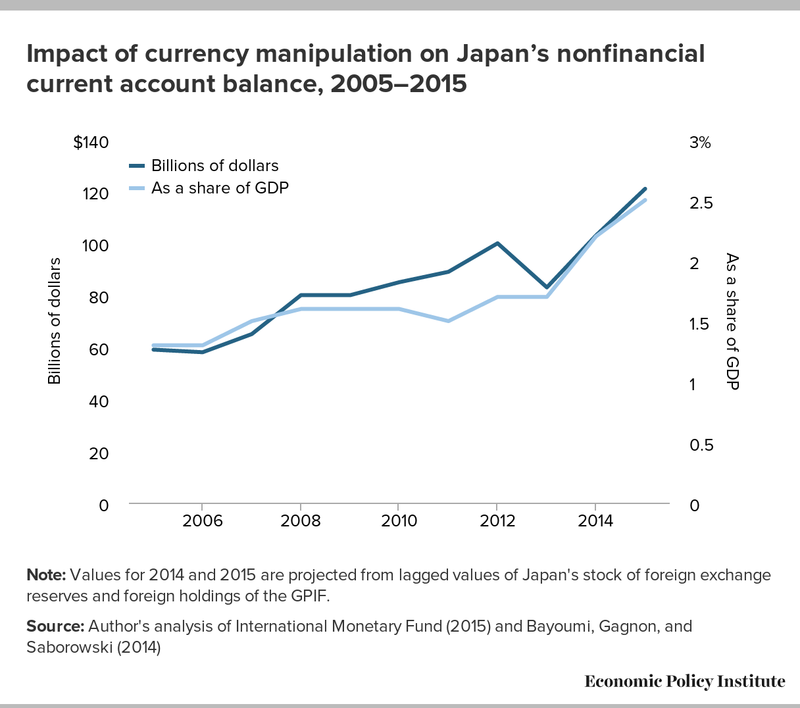 In a new paper, Bayoumi, Gagnon, and Saborowski (2014) (henceforth referred to as BGS) identified a second, and potentially more important channel through which Japan’s holdings of foreign assets will influence Japan’s current account balance. In this paper, the authors distinguish between countries with relatively closed capital markets (such as China) and those with relatively open capital markets (such as Japan). For countries with closed capital markets, there is a strong, direct relationship between purchases of foreign assets and the current account, confirming Gagnon’s earlier (2013) findings. For countries with relatively open capital markets, such as Japan, BGS found that there is a strong relationship between the lagged stock of foreign assets and the current account balance. The authors believe that this effect is related to portfolio balance effects which have a direct effect on private capital flows and the current account balance. Specifically, they found that the current account is increased by .07 percent (of GDP) for each one-percentage-point increase in the lagged stock of net official assets BGS (2014, 12). This effect is large and significant in the case of Japan, because of its large government (official) holdings of net foreign assets (Figure A, above), which reached 30.9 percent of its GDP in 2013 and were projected to exceed 35 percent in 2014. Note: Values for 2014 and 2015 are projected from lagged values of Japan's stock of foreign exchange reserves and foreign holdings of the GPIF. The estimated impact of Japan’s official holdings on its current account net of investment income rises from $59.2 billion (1.3 percent of GDP) in 2005 to $120.9 billion (2.5 percent of GDP) in 2015, as shown in Figure E. Japan has also maintained a large and growing surplus on net investment income in its current account, which reached $160 billion in 2013 (IMF 2015). Taken together, these results suggest that currency manipulation could produce a total current account surplus of up to $280 billion (or more than 5 percent of GDP) within the next few years. This is slightly larger than Japan’s actual current account balance in 2007 (4.9 percent of GDP, as shown in Figure D). The real value of the yen at the end of 2014 was actually below the level that prevailed in 2007 (Laffer 2014), so this forecast is consistent with past experience. These results suggest that the IMF’s forecast of Japan’s total current account balance of $76.4 billion in 2019 (Figure D) is far too conservative. Purchases and holdings of foreign assets by official government agencies in Japan (including the Bank of Japan and the GPIF) are the most significant, direct tool used to manipulate the value of the yen. Other factors considered here, including quantitative easing, the carry trade, and Abe’s 2012 announcement of his intent to reduce the value of the yen, have reinforced the effects of Japan’s holdings of foreign assets on the yen. 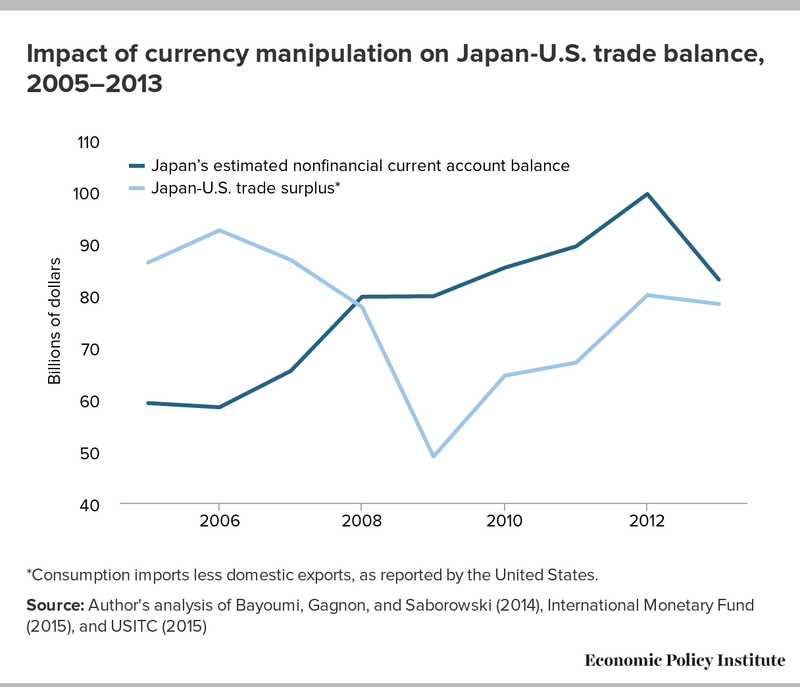 Currency manipulation has also had a significant impact on Japan’s bilateral trade with the United States, as shown below. The United States and Japan have a long and difficult history of trade disputes related to tariff and nontariff barriers to trade, including Japan’s closed agricultural markets and the effects of Japanese trade and industrial policies on a number of sectors ranging from semiconductors to motor vehicles and parts (Tyson 1992, Prestowitz 1993). However, currency manipulation is the most important cause of the large and growing U.S. trade deficit with Japan. But for the subsidies provided by currency manipulation, Japanese automakers would have found it difficult or impossible to achieve their dominance in wide segments of the U.S. market. And currency manipulation has made it difficult or impossible for U.S. firms to penetrate Japanese markets for many products, due to the effective tax imposed on U.S. products by currency manipulation. Despite the ebbs and flows of Japan’s trade and current account balances with the world, Japan has maintained a large, stable trade surplus with the United States since 2005, as shown in Figure F. Aside from the peak recession year of 2009, between 2005 and 2013 Japan maintained a goods trade surplus with the United States that ranged between $64.5 billion and $92.5 billion (based on reported U.S. trade flows, USITC 2015) and stood at $78.3 billion in 2013. The effect of the carry trade (in setting limits on the appreciation of the yen) helps explain the persistence of Japan’s trade surplus with the United States. *Consumption imports less domestic exports, as reported by the United States. The U.S. is also Japan’s largest and most reliable trade partner. Japan’s trade surplus with the United States explains most of Japan’s entire estimated nonfinancial trade surplus resulting from currency manipulation (as estimated in Figure E and shown also in Figure F). Currency manipulation by Japan is the most important cause of the growing U.S. goods trade deficit with Japan. The next section estimates the effects of currency manipulation and the U.S. trade deficit with Japan on the U.S. economy, and on trade-related employment in the United States. This analysis uses a simple macroeconomic model developed by Bivens (2014) to estimate the effects of the U.S. goods trade deficit with Japan in 2013 on U.S. GDP and employment, including respending effects (the approach is also based, in part, on the models developed in Scott 2014b). As part of our overall model, an input-output (IO) model was used to estimate the distribution of jobs lost or gained by industry. It provides estimates of the direct and indirect labor requirements of producing output in a given domestic industry.10 The model includes 195 U.S. industries as defined by the Bureau of Labor Statistics (BLS), 77 of which are in the manufacturing sector (see the appendix for details on model structure and data sources). The macroeconomic model estimates the amount of labor (number of jobs) required to produce a given volume of exports and the labor displaced when a given volume of imports is substituted for domestic output. The IO model is used to determine the distribution of jobs supported by exports and the jobs displaced by imports in the U.S. economy. This paper assumes that currency manipulation is the primary cause of the U.S. goods trade deficit with Japan. Jobs displaced by the U.S.-Japan trade deficit directly decrease total employment in trade-related industries, especially those in manufacturing. The IO model also estimates the number of “indirect” jobs supported or displaced in supplier industries, including those in manufacturing, and in related service sectors such as law, accounting, managerial, and temporary help services. Finally, wages that would have been earned had trade with Japan been balanced would have supported additional rounds of “respending,” which would have a multiplier effect on output (GDP) and employment. This paper estimates the impacts of the U.S.-Japan trade deficit with disaggregated trade data that is matched with each of the 195 BLS industries in the IO model. A vector of consumer spending in the domestic economy (from the IO final demand tables) is used to estimate the distribution of jobs that were displaced by the loss of wages in the domestic economy (the multiplier effect). Total employment effects of the Japan trade deficit, by industry, are estimated as the sum of the direct, indirect, and respending jobs. These techniques generated estimates of direct, indirect, and respending jobs lost by industry. These results were used with data on the distribution of employment by industry and by state and congressional district (discussed below under “Job losses and gains by state and congressional district” and in the appendix) to estimate the impacts of the U.S.-Japan trade deficit on U.S. employment in these areas. Each $1 billion in U.S. exports supports some American jobs. However, each $1 billion in U.S. imports displaces the American workers who would have been employed making these products in the United States. The net employment effect of trade depends on the size of the trade balance. A trade surplus will, all else equal, support a positive number of domestic jobs, while trade deficits result in net U.S. job displacement. The United States has run trade deficits since 1975, which have increased steadily since the early 1990s, and especially since the Asian financial crisis of 1997–1998, when many Asian currency manipulators (including Japan, as shown above) experienced sharp depreciations of their currencies. U.S. trade deficits did contract sharply in 2009, when U.S. trade with all countries collapsed due to the recession of 2007–2009, but they have grown significantly since then (USITC 2015). As this research has shown, currency manipulation by Japan has resulted in large, persistent U.S. trade deficits which have displaced hundreds of thousands of U.S. jobs. This in turn has increased budget deficits and negatively impacted both federal and state finances. Note: All of the tables referenced in the text are available at the end of this report. The main macroeconomic results of this research are summarized in Table 1. This paper uses economic multipliers developed by Bivens (2014). As he notes, “the most pressing economic challenge for the U.S. economy remains the depressed labor market” (Bivens 2014, 1). Though not shown in the table, the share of prime-aged adults (age 25–54) currently employed remains barely above the level at the official end of the recession in 2009, and well below the peaks of the last two business cycles. In this economic environment, changes in spending for domestic goods have large multiplier effects on the economy. Bivens estimates that in the current economic environment, increases in infrastructure spending have a large, macroeconomic “multiplier” effect on the domestic economy through the wages earned and spent by workers employed by such spending. Bivens estimates that infrastructure spending has a multiplier effect of 1.6 on the domestic economy (Bivens 2014, Table 5 at 21). This paper assumes that changes in trade flows also have a multiplier effect of 1.6, and that reductions in domestic spending caused by the U.S.-Japan trade deficit impact the economy in a way that is symmetric with increases in spending associated with increased infrastructure investment (that is, the multiplier works the same way for both increases and decreases in domestic spending). Thus, the $78.3 billion goods trade deficit with Japan reduced U.S. GDP by $125.3 billion in 2013, or 0.747 percent of U.S. GDP in 2013, as shown in Table 1. The overall number of jobs lost by this reduction in output (GDP) is estimated from a simple rule of thumb also developed by Bivens (2014, Table 5 at 21), based on historical relationships between output and employment. Each 1 percent increase in GDP supports 1.2 million jobs in the economy. Likewise, an identical reduction in GDP would eliminate 1.2 million jobs in the U.S. economy. Using both the macroeconomic and the jobs multipliers, we find that the $78.3 billion U.S.-Japan trade deficit eliminated 896,600 jobs in the domestic economy. Reductions in domestic employment decrease tax revenues (through the fall in national income and wages) and increase safety-net expenditures (through increased spending for unemployment insurance, food stamps, Medicaid, and other forms of public assistance). Analysis of the effects of rising unemployment on net federal budget deficits indicates that federal deficits are decreased (or increased) by $0.37 for each dollar of increase (or decline) in GDP (Bivens and Edwards 2010). As a result, the estimated reduction in GDP caused by the U.S.-Japan trade deficit in 2013 increased the federal deficit in that year by $46.4 billion, or 7.4 percent of the total federal deficit in calendar year 2013.11 This effect on federal deficits will continue, in proportion to the bilateral deficit and GDP, as long as the U.S.-Japan goods trade deficit persists. Were the Japan trade deficit to persist at the present level, the loss of jobs and wages would increase the federal budget deficit by $460 billion over the next decade. State and local revenues and spending are also reduced by the U.S.-Japan trade deficit. Recent empirical research has estimated that, on average, state budgets (spending minus revenues) will decrease by $0.14 for each dollar of decline in GDP (Kondo and Svec 2009, 10). Decreases in GDP associated with the Japan trade deficit have thus reduced net state and local resources by $17.5 billion in 2013 alone. The models developed here, coupled with data on U.S. imports from and exports to Japan in 2013, allow us to estimate total jobs lost overall and at the sector level. Direct, indirect, and respending jobs (aggregated over all industries) are reported in Table 2. The U.S. trade deficit with Japan directly displaced 148,400 U.S. jobs in commodity and manufacturing industries that competed with unfairly traded imports and exports from Japan in 2013. Our model estimates the employment effects of the trade deficit with Japan. The model estimates the amount of labor (number of jobs) required to produce a given volume of exports and the labor displaced when a given volume of imports is substituted for domestic output. The difference between these two numbers is essentially the jobs displaced by the growing trade deficit, holding all else equal. 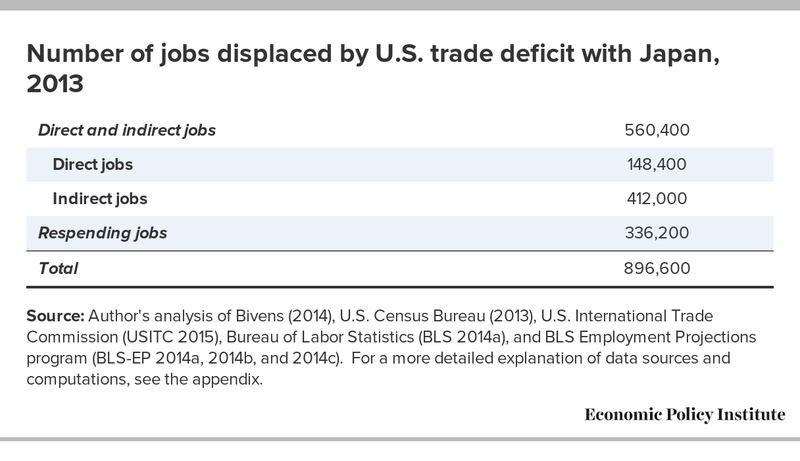 This estimate of the net number of jobs supported and displaced is used to allocate the total number of direct and indirect jobs displaced due to the trade deficit, as described in the appendix. In addition to the 148,400 direct jobs lost, the U.S.-Japan trade deficit is responsible for an additional 412,000 indirect jobs in supplier industries, including jobs in manufacturing, commodity, and service industries, as shown below. Finally, wages lost due to the trade deficit with Japan would have supported an additional 336,200 respending jobs. Combining direct, indirect, and respending jobs yields a total of 896,600 jobs displaced by the U.S.-Japan trade deficit. Actual U.S. imports from and exports to Japan in 2013 were used to estimate the distribution of net jobs (direct, indirect, and respending) displaced by the U.S. trade deficit with Japan, by industry for the 45 unique industries (plus eight aggregate sectors) in the U.S. Census Bureau sector plan (U.S. Census Bureau 2009). Our analysis compares jobs lost or gained with 2011 employment data as a baseline to estimate jobs gained or lost as a share of industry employment (U.S. Census Bureau 2013). The United States had a trade surplus with Japan in a few industries in 2013, including agriculture and processed food products. Trade with Japan did create some net jobs in the United States in these industries. The breakdown by industry is shown in Table 3. Overall, the U.S. trade deficit with Japan displaced 466,000 jobs in manufacturing (52.0 percent of jobs lost across all industries), by far the largest number of jobs lost in any major industry. Within manufacturing, by far the largest losses occurred in motor vehicles and parts, which lost 118,800 jobs (13.3 percent of total jobs lost). Other manufacturing industries with large losses include machinery (96,600 jobs), fabricated metal products (80,800 jobs), and computer and electronic parts (66,100 jobs). Trade with Japan did contribute to employment in a few manufacturing industries: food and beverage and tobacco products (14,600 jobs supported, 14,400 in food and 200 in beverage and tobacco products) and leather and allied products (2,000 jobs). The U.S.-Japan trade deficit was also responsible for significant job losses outside of manufacturing in administrative and support industries (61,800 jobs); health care and social assistance (60,500 jobs); retail trade (51,800); professional, scientific, and technical services (50,000 jobs), and accommodation and food services (48,500 jobs). Net trade with Japan also created a total of 63,600 jobs in U.S. agricultural industries. Job gains and losses in these industries are the result of net trade flows in sectors with high levels of imports from and exports to Japan, as well as respending effects, which have their largest effects on employment in service industries. Estimates of job losses by industry form the foundation for the estimation of job losses and gains by state and congressional district. Estimates of employment by state and congressional district for each of the 45 unique industries in the model were obtained from the U.S. Census Bureau (2013). These were used to estimate employment shares by state and congressional district for each industry. These shares were used to estimate total jobs lost or gained per district, with 2011 employment as the baseline for estimating jobs lost as a share of total state or district employment (see the appendix for further details). Thus, states and congressional districts that have high shares of employment in industries with a large exposure to trade with Japan (such as motor vehicles and equipment, machinery, or fabricated metal products) were the largest losers from Japan trade deficits. The trade deficit with Japan resulted in net job losses in all 50 states. Jobs lost by state, ranked by shares of total state employment are reported in Table 4. (Supplemental Table 1 ranks the states by net jobs displaced and Supplemental Table 2 lists them alphabetically). Michigan lost the most jobs as a share of total state employment, with 56,200 jobs lost (1.34 percent of the total state employment in 2011). Eight of the 10 states with the highest job losses (as a share of total employment) are in the Midwest or the East South Central census regions, all states where manufacturing predominates: Michigan (56,200 jobs), Indiana (33,700 jobs), Ohio (50,900 jobs), Kentucky (16,400 jobs), Wisconsin (24,300 jobs), Tennessee (23,200 jobs), Alabama (16,000 jobs) and Illinois (45,500 jobs). Rounding out the top 10 states losing the largest shares of jobs were South Carolina (16,800 jobs) in the South Atlantic region, and New Hampshire (5,300 jobs) in New England. Manufacturing industries are also dominant these two states. 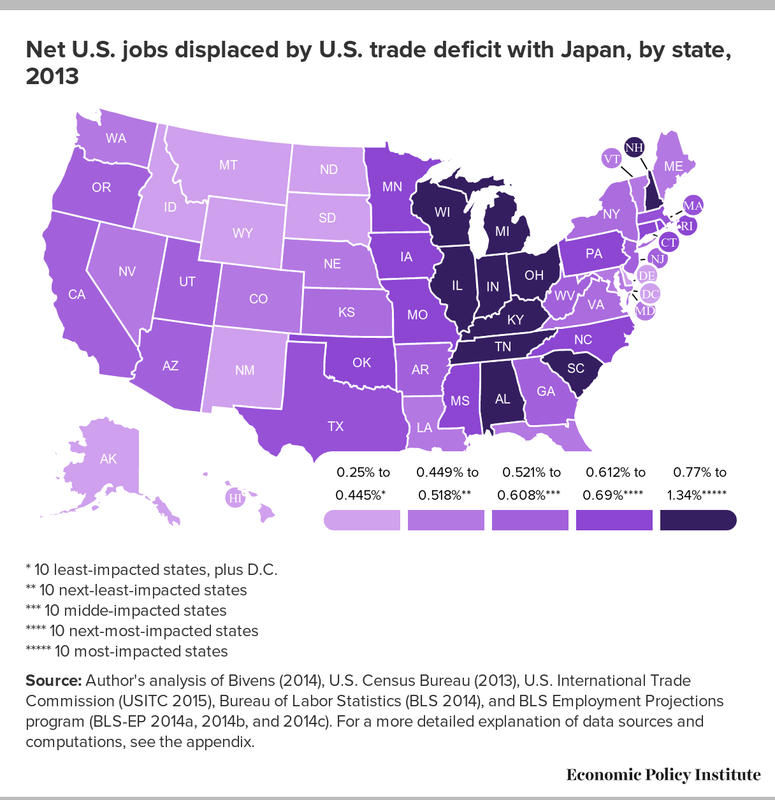 The distribution of job losses in the 50 states and the District of Columbia is shown in the map in Figure G. In the online version of this report, the map is clickable, and contains additional data on job losses due to the U.S. trade deficit with Japan. Source: Author's analysis of Bivens (2014), U.S. Census Bureau (2013), U.S. International Trade Commission (USITC 2015), Bureau of Labor Statistics (BLS 2014), and BLS Employment Projections program (BLS-EP 2014a, 2014b, and 2014c). For a more detailed explanation of data sources and computations, see the appendix. This study also estimates trade-related employment changes by congressional district for the 113th Congress (elected in 2012), using new congressional district boundaries from the 2010 Census. 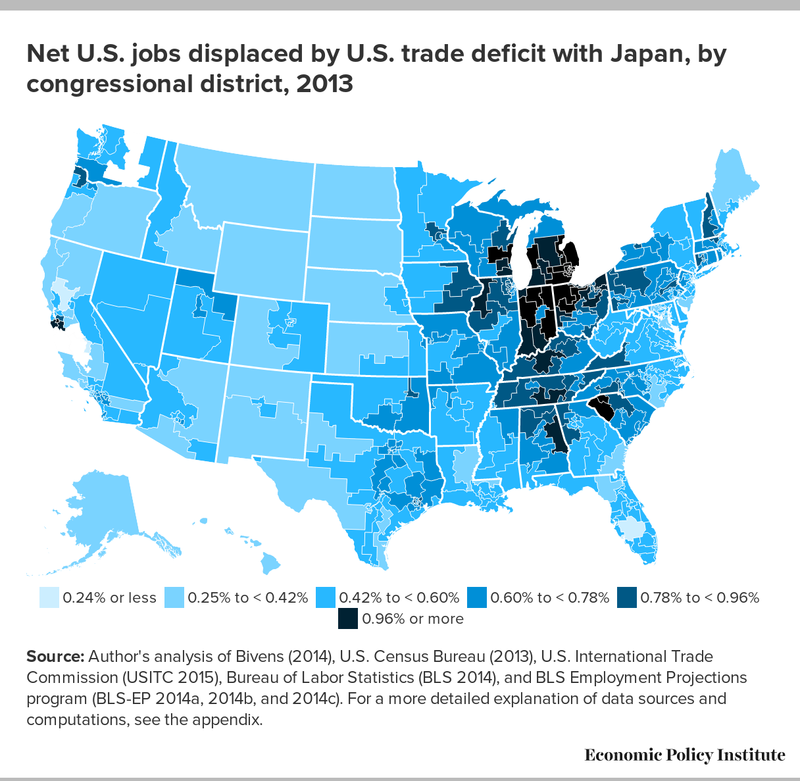 The distribution of job losses in the 435 congressional districts and in the District of Columbia is shown in the map in Figure H. In the online version of this report, the map is clickable, and contains additional data on job losses due to the U.S. trade deficit with Japan. Our analysis compares jobs lost with 2011 employment data as a baseline to estimate job losses as a share of district employment. The data show that the U.S.-Japan trade deficit resulted in net job losses in all but three U.S. Congressional Districts, and has displaced up to 6,000 jobs in a single U.S. congressional district. The 20 congressional districts with the largest shares of jobs lost are shown in Table 5. Each of the top 20 districts lost between 3,100 and 6,000 jobs. The 10th Congressional District in Michigan was the hardest hit district in the country, losing 5,500 jobs (1.78 percent of total employment). Job losses as a share of district employment among the top 20 U.S. congressional districts ranged from 1.17 percent to 1.78 percent. Of the states with top-20 job-losing districts, the hardest hit state was Michigan (with 10 districts in the top 20, followed by Indiana (four districts); Ohio and South Carolina (two districts each); and California and Wisconsin (one each). Complete lists of jobs lost or gained by congressional district for all 435 congressional districts and for the District of Columbia are included in Supplemental Table 3. Only two congressional districts experienced net job gains as a result of trade with Japan in 2013. They are the 21st Congressional District in California (1,300 jobs gained) and the 4th Congressional District in Washington (100 jobs gained). Currency manipulation is the most important cause of the large and growing U.S. trade deficit with Japan, which eliminated 896,600 U.S. jobs in 2013 alone. In the past two years, Japan has driven down the value of the yen through large purchases of foreign assets, massive quantitative easing, and its announced intention to reduce the yen’s value. These actions threaten to increase Japan’s trade and current account surpluses and the U.S.–Japan trade deficit. In this context the United States should insist that currency manipulation be directly addressed in the proposed Trans-Pacific Partnership. Members of the TPP should agree to rebalance trade and currency markets, including by divesting excess foreign assets in government portfolios, before any trade and investment agreement takes effect. They should also forswear the use of currency manipulation in the future, and submit to strong, binding currency disciplines in the event these commitments are violated. A number of prominent economists have developed specific proposals for addressing currency manipulation in the core of the agreement. Bernstein (2015) suggests that the TPP must clarify the allowable limits on holdings of foreign assets as part of the definition of currency manipulation. If these limits are violated, he recommends allowing an array of responses including taxes on the imports of currency manipulators, fines, and temporary repeal of trade privileges negotiated under the agreement. Fred Bergsten has also called for the inclusion in the TPP and other future trade agreements of a currency chapter that includes “clear obligations to avoid currency manipulation” (Bergsten 2014, 2). He recommends that these agreements should include an effective dispute resolution mechanism and sanctions against violators to enforce these obligations. Bergsten enumerates five types of sanctions that could be included in the agreement’s proposals, including withdrawal of concessions made in the TPP agreement, imposition of countervailing duties, import surcharges, monetary fines, and countervailing currency intervention, or CCI (Bergsten 2014, 7). The CCI proposal calls for the U.S. government (and other countries injured by currency manipulation) to offset foreign government purchases of financial assets denominated in U.S. dollars and other currencies by purchasing financial assets issued in the offending country’s currency (for example, through U.S. government purchases of yen-denominated stocks and bonds). Bergsten and Gagnon (2012) have proposed CCI as a general response to currency manipulation, and Bergsten (2014) proposes authorizing such activities specifically as sanctions available in the TPP. The findings of this study suggest somewhat stronger measures addressing currency manipulation in the TPP. Purchases and holdings of foreign exchange reserves by the Bank of Japan, and of other foreign assets by the GPIF, are an indispensable element of Japan’s currency policy. Without its massive government holdings of foreign assets, and its continuing and periodic massive purchases of new foreign assets, the government of Japan would have been unable to prevent the yen from adjusting to levels consistent with trade and current account balances. The United States needs to negotiate currency disciplines that would compel Japan and other currency manipulators to divest themselves of excess holdings of foreign assets, or to otherwise be penalized for or take measures to offset currency manipulation. Such disciplines must be included in any future trade and/or investment agreement with Japan and other countries that are, or could be, engaged in currency manipulation now or in the future. Absent such disciplines, the United States should not complete the pending negotiations, and Congress should not approve implementing legislation for the proposed Trans-Pacific Partnership. In addition, there are a number of steps that should be taken to address global currency manipulation by more than 20 countries. In the short run, Congress should pass legislation authorizing the Commerce Department to treat currency manipulation as a countervailable subsidy in countervailing duty (CVD) trade complaints. This would provide immediate relief to importers that have been hurt by unfair competition from imports from currency manipulators. It would also send a strong signal to these countries that the United States is willing to confront currency manipulators. (Scott 2014b, 12). Ultimately, the United States must develop measures to prevent or offset any efforts to manipulate currency through purchases of foreign exchange reserves by all countries with significant, sustained trade surpluses and excessive reserves of government-owned foreign assets. As recommended by Gagnon and Hufbauer (2011) and Bergsten and Gagnon (2012), the administration must implement strategies that would tax and/or offset purchases of foreign assets by currency manipulating governments, which would make efforts to manipulate the dollar and other currencies costly and/or futile. The United States should also announce its intent to take these measures and encourage other countries to adopt similar measures to block or offset currency manipulation. But the first rule for addressing currency manipulation should be to do no harm. The United States should refuse to enter into the proposed Trans-Pacific Partnership with Japan and 10 other countries unless that agreement includes strong and enforceable prohibitions on currency manipulation. Otherwise, we would be locked into an open trading relationship with Japan, a country that has demonstrated a persistent commitment to maintaining an undervalued currency that has generated a sustained, job-destroying trade deficit with the United States. This analysis uses a simple macroeconomic model developed by Bivens (2014) to estimate the effects of the U.S. goods trade deficit with Japan in 2013 on U.S. GDP and employment, including respending effects (based, in part, on the models developed in Scott 2014b). It then uses an input-output model based on Bureau of Labor Statistics (BLS) data to allocate jobs displaced by the Japan trade deficit to industries, states, and congressional districts. The research uses data from 2013 to estimate the impacts of the trade deficit in that year. This appendix identifies the specific data sources and comparisons used. This paper uses economic multipliers developed in by Bivens (2014). As he notes, “the most pressing economic challenge for the U.S. economy remains the depressed labor market” (Bivens 2014, 1). The share of prime-aged adults (age 25–54) remains barely above the level at the official end of the recession in 2009, and well below the peaks of the last two business cycles. In this economic environment, changes in spending for domestic goods have large multiplier effects on the economy. Bivens estimates that in the current economic environment, increases in infrastructure spending have a large, macroeconomic multiplier impact on the domestic economy through the wages earned and spent by workers employed by such spending. Bivens estimates that infrastructure spending has a multiplier impact of 1.6 on the domestic economy (Bivens 2014, Table 5 at 21). This paper assumes that changes in trade flows also have a multiplier effect of 1.6, and that reductions in domestic spending caused by the U.S.-Japan trade deficit impact the economy in a way that is symmetric with increases in spending associated with increased infrastructure investment (that is, the multiplier works the same way for both increases and decreases in domestic spending). 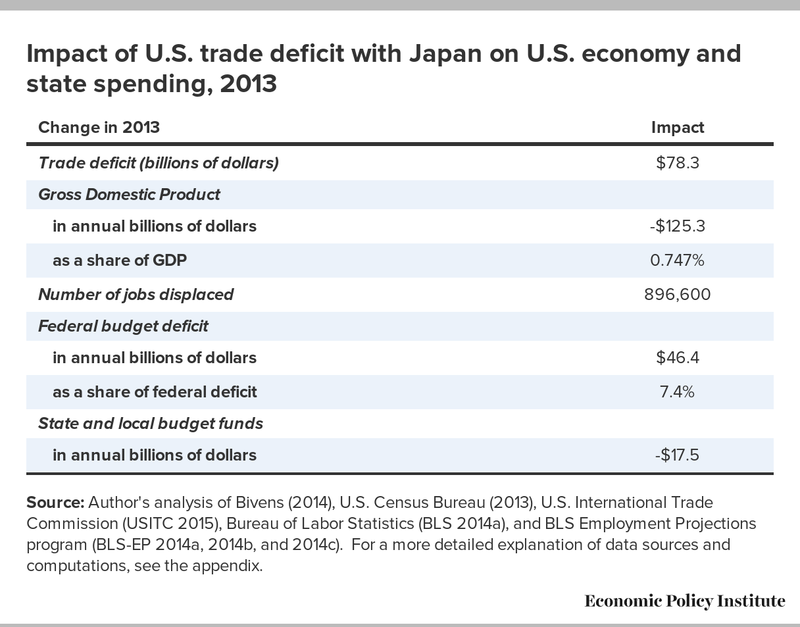 The Bivens model is used to estimate the impact of the U.S.-Japan trade deficit on U.S. GDP. The overall number of jobs supported by this reduction in output (GDP) is estimated from a simple rule of thumb also developed by Bivens (2014, Table 5 at 21), based on historical relationships between output and employment in which each 1 percent increase in GDP supported 1.2 million jobs in the economy. Likewise, an identical reduction in GDP would eliminate 1.2 million jobs in the U.S. economy. Reductions in domestic employment decrease tax revenues (through the fall in national income and wages) and increase safety-net expenditures (through increased spending for unemployment insurance, food stamps, Medicaid, and other forms of public assistance). Analysis of the effects of rising unemployment on net federal budget deficits indicates that federal deficits are increased by $0.37 for each dollar of increased GDP (Bivens and Edwards 2010). State and local revenues and spending are also reduced by the U.S.-Japan trade deficit. Recent empirical research has estimated that, on average, state budgets (spending minus revenues) will decrease by $0.14 for each dollar of decline in GDP (Kondo and Svec 2009, 10). The trade and employment analysis in this report is based on a detailed, industry-based study of the relationships between changes in trade flows and employment for each of approximately 195 individual industries of the U.S. economy, specially grouped into 45 custom sectors and using the North American Industry Classification System (NAICS) with data obtained from the U.S. Census Bureau (2013) and the U.S. International Trade Commission (USITC 2015). This study separates exports produced domestically from foreign exports—which are goods produced in other countries, exported to the United States, and then reexported from the United States. Because only domestically produced exports generate jobs in the United States, employment calculations here are based only on domestic exports. The measure of the net impact of trade used here to calculate the employment content of trade is the difference between domestic exports and consumption imports. The number of jobs supported by $1 million of exports or imports for each of 195 different U.S. industries is estimated using a labor requirements model derived from an input-output table developed by the BLS–EP (2014a).12 This input-output (IO) model includes both the direct effects of changes in output (for example, the number of jobs supported by $1 million in auto assembly) and the indirect effects on industries that supply goods (for example, goods used in the manufacture of cars). So, in the auto industry for example, the indirect impacts include jobs in auto parts, steel, and rubber, as well as service industries such as accounting, finance, and computer programming that provide inputs to the motor-vehicle manufacturing companies. This model estimates the labor content of trade using empirical estimates of labor content and goods flows between U.S. industries in a given base year (an input-output table for the year 2010 was used in this study) that were developed by the U.S. Department of Commerce and the BLS–EP. It is not a statistical survey of actual jobs gained or lost in individual companies, or the opening or closing of particular production facilities. Nominal trade data used in this analysis were converted to constant 2005 dollars using industry-specific deflators (see next section for further details). This was necessary because the labor requirements table was estimated using price levels in that year. Data on real trade flows were converted to constant 2005 dollars using industry-specific price deflators from the BLS–EP (2014b). These price deflators were updated using Bureau of Labor Statistics producer price indexes (industry and commodity data; BLS 2014). Use of constant 2005 dollars was required for consistency with the other BLS models used in this study. The IO model is used to estimate the distribution of jobs displaced by trade, and by the loss of wages and respending, as explained below. The findings in this paper come from a four-step data retrieval process followed by a four-step analysis. Step 1. U.S. trade data were obtained from the U.S. International Trade Commission Interactive Tariff and Trade DataWeb (USITC 2015) in four-digit, three-digit, and two-digit NAICS format for total U.S. Consumption Imports and Domestic Exports. Step 2. To conform to the BLS Employment Requirements tables (BLS-EP 2014a), trade data must be converted into the BLS industry classifications system. For NAICS-based data, there are 195 BLS industries. The data are then mapped from NAICS industries onto their respective BLS sectors. The trade data, which are in current dollars, are deflated into real 2005 dollars using published price deflators from the BLS-EP (2014b) and the Bureau of Labor Statistics (2014). Step 3. A 1×195 vector of data for total personal consumer expenditures (PCE) in 2005 dollars for 2010 was extracted from historical input-output data assembled by the BLS-EP (2014c). These data were used to estimate total employment supported by PCE expenditures (using the job-equivalents analysis described below). The results were used to estimate the share of respending jobs supported in each of 195 BLS industries. Step 4. Real domestic employment requirements tables are downloaded from the BLS-EP (2014a). These matrices are input-output industry-by-industry tables that show the employment requirements for $1 million in outputs in 2005 dollars. So, for industry i the aij entry is the employment indirectly supported in industry i by final sales in industry j and where i=j, the employment directly supported. [J2013] is a 195×2 matrix of job displaced by imports and jobs supported by exports for each of 195 industries in 2013. This matrix is used to create vectors of net jobs displaced by imports from Japan and jobs supported exports to Japan, as described above. The total number of direct and indirect jobs displaced by trade is estimated using the macroeconomic model described above. The employment estimates for retail trade, wholesale trade, and advertising were set to zero in the trade portion of this analysis.13 We assume that traded goods must be sold and advertised whether they are produced in the United States or imported for consumption. Direct and indirect jobs. In order to estimate the direct jobs, the diagonal vector was extracted from the employment requirements matrix [E2010]. This vector was multiplied times the trade vector to estimate direct trade-related jobs (e.g., [JDIRECT2013]) for both imports and exports. Indirect jobs just equal total jobs less direct (e.g. [JINDIRECT2013] =[J2013]- [JDIRECT2013]). Step 2. Combining macroeconomic and IO jobs analyses. The IO jobs estimates in vectors [J2013] and [JPCE2010] are converted into share vectors, representing the share of total jobs supported in each of 195 industries by reductions in trade deficits and related respending in the domestic economy. The shares in each vector sum to 1. Share vectors are used to allocate jobs gained by industry. The sum of direct and indirect jobs gained (Table 2) in each scenario are multiplied by the trade jobs share vector derived from [J2013], and the respending (also Table 2) jobs are multiplied by respending jobs share vector derived from [JPCE2010]. The results yield estimates of jobs gained or lost by industry in the total economy as a result of the U.S.-Japan trade deficit. where [Stj2013] is the 45×51 matrix of job gains and losses supported by state by industry. To get state total job losses, we add up the subsectors in each state. Step 4. Congressional district analysis. Employment by congressional district, by industry, by state is obtained from the ACS data for 2011, which for the first time use geographic codings which match the boundaries of the 113th Congress (elected in 2012). In order to calculate job gains or losses in each congressional district, we use each column in [Stj2013], which represent individual state job-gain and loss-by-industry estimates, and define them as [Stj01], [Stj02], [Stji]…[Stj51], with i representing the state number and each matrix being 45×1. where [Cdji] is defined as the 45xY job gains and losses in state i by congressional district by industry. 1. Gagnon (2012) provides a ranking of currency manipulators based on total holdings of foreign exchange reserves (only). 2. ULC-Based (Unit Labor Cost) Real Effective Exchange Rate Index, 2010 = 100, (International Monetary Fund 2015). This is a market-value index such that an increase in the index represents growth in the value of the yen, and vice versa (“up is up,” as market analysts would say). In contrast, the market price of the yen (say, for example, in yen per dollar) moves in the opposite direction from the quoted price—an increase in the market price of the currency (in yen per dollar) corresponds to a decrease in the value of the yen. 3. IMF (2015), Board of Governors of the Federal Reserve System (2015), and author’s analysis, as shown later in Figure B. 4. The market value of the yen dropped significantly in the second half of 2014 (as shown later in Figure B). Thus, the end-of-year real value of yen was below the period average. This is consistent with Laffer’s observation that the end-of-year value of the yen was below its level in 2007 (Laffer 2014, 24). 5. Actual holdings of foreign assets by the GPIF rose from $244.3 billion in 2012 to $308.8 billion in 2013, according to financial statements (GPIF 2015), an increase of 26.4 percent. This figure was used to estimate the level of foreign holdings by the GPIF in prior years in Figure A. It was assumed that targeted portfolio reallocations took effect in 2014. Implementation of this reallocation could take longer, but holdings of these assets will ultimately have an impact on Japan’s trade and current account balances. 6. The U.S. monetary base reached $3.9 trillion in the second quarter of 2014, while Japan’s monetary base equaled $2.4 trillion, at end-of-period exchange rates (IMF 2015). 7. The sharp fall in the yen after 2012 also had a negative impact on the current account. In the short run, depreciation raises the yen cost of imports, while exports are only expected to improve in the medium to long term. This is the well-known J curve effect, which is based on the observation that depreciation tends to worsen the trade balance in the short run and improve it in the medium to long term. 8. Other variables included in the BGS model include net official flows (the change in official asset holdings from year to year), and dummy variables designed to measure the impact of capital mobility. The model is estimated using instrumental variables techniques with a number of instruments. Estimates show that the direct effects of official flows are small for countries with high capital mobility, so the primary channel of current account impact in such countries is through the net official assets variable, which is a measure of the stock of foreign assets held by government agencies (BGS 2014, 8–12). 9. Japan is a large net investor, and it maintained a large surplus of net investment income which increased steadily from $100 billion in 2005 to $160 billion in 2013 (IMF 2015). These amounts are in addition to the estimated surplus on the current account (net of investment income) shown in Figure E.
10. The Economic Policy Institute and other research entities have examined the job impacts of trade in recent years by netting the job opportunities lost to imports against those gained through exports. This report uses standard input-output models and data to estimate the jobs displaced by trade. Many reports by economists in the public and private sectors have used an “all-but-identical” methodology to estimate jobs gained or displaced by trade, including Groshen, Hobijn, and McConnell (2005) of the Federal Reserve Bank of New York, and Bailey and Lawrence (2004) in the Brookings Papers on Economic Activity. The U.S. Department of Commerce recently published estimates of the jobs supported by U.S. exports (Johnson and Rasmussen 2013) using input-output and “employment requirements” tables from the Bureau of Labor Statistics Employment Projections program (BLS-EP 2014a), the same source used to develop job displacement estimates in this report. 11. The calendar year deficit was computed as a weighted average of the actual federal deficit of $680 billion in fiscal year 2013 (Irwin 2013) and the actual federal deficit of $483 billion in fiscal year 2014 (Collender 2014). The weighted average of these two estimates (using weights of 0.75 for FY 2013 and 0.25 for FY 2014) was $630.7 billion for calendar year 2013. 12. The model includes 195 NAICS industries. The trade data include only goods trade. Goods trade data are available for 85 commodity-based industries, plus software, waste and scrap, used or second-hand merchandise, and goods traded under special classification provisions (e.g., goods imported from and returned to Canada; small, unclassified shipments). Trade in scrap, used, and second-hand goods has no impacts on employment in the BLS model. Some special classification provision goods are assigned to miscellaneous manufacturing. 13. The respending analysis does include some impacts on employment in wholesale and retail trade, and in advertising. Thus, the net jobs analysis presented in Table 3 (which includes all direct, indirect, and respending jobs supported or displaced by the trade deficit) does include some net jobs displaced in these industries. 14. The Census Bureau uses its own table of definitions of industries. These are similar to NAICS-based industry definitions, but at a somewhat higher level of aggregation. For this study, we developed a crosswalk from NAICS to Census industries, and used population estimates from the ACS for each cell in this matrix. Gagnon, Joseph, and Gary Hufbauer. 2011. “Taxing China’s Assets: How to Increase U.S. Employment Without Launching a Trade War.” Foreign Affairs.com. Government Pension Investment Fund, Japan (GPIF). 2015. ”Fund Investment Operations (Review of Operations in Fiscal 2012 and 2013).” http://www.gpif.go.jp/en/fund/ Accessed January 15.
International Monetary Fund (IMF). 2015. International Financial Statistics: Database and Browser (CD ROM). Washington, D.C.: International Monetary Fund. Prestowitz, Clyde. 1993. Trading Places: How We Are Giving Our Future to Japan and How to Reclaim It. New York: Basic Books. Scott, Robert E. 2014c. “The Effects of NAFTA on US Trade, Jobs and Investment, 1993-2013.” Review of Keynesian Economics, vol. 2, no. 4, Winter 2014, pp. 429-441. Sovereign Wealth Fund Institute (SWFI). 2015. “Fund Rankings: Sovereign Wealth Fund Rankings, Largest Sovereign Wealth Funds by Assets Under Management.” http://www.swfinstitute.org/fund-rankings/ (Accessed January 16, 2015). Tyson, Laura. 1992. Who’s Bashing Whom: Trade Conflict in High-Technology Industries. Washington, D.C.: Institute for International Economics. Source: Author's analysis of Bivens (2014), U.S. Census Bureau (2013), U.S. International Trade Commission (USITC 2015), Bureau of Labor Statistics (BLS 2014a), and BLS Employment Projections program (BLS-EP 2014a, 2014b, and 2014c). For a more detailed explanation of data sources and computations, see the appendix. *Totals may vary slightly due to rounding.